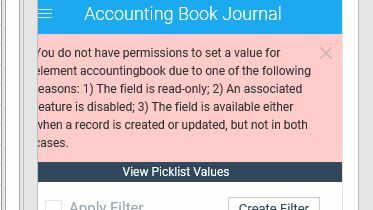 If you receive an error like the one below ("You do not have permissions to set a value for element [element] due to one of the following reasons: 1) The field is read-only; 2) An associated feature is disabled; 3) The field is available either when a record is created or updated, but not in both cases read on. There are multiple scenarios when you see this error, when trying to upload records using CloudExtend Excel for NetSuite. The following is the partial list of reasons for the error and the recommended solution. Resolve this by adding the field 'custom form' to your template and setting the value to the form name that has the field available (or add the field to the default form). Resolve this by contacting your NetSuite Administrator to add the appropriate permissions to your role. Resolve this by removing the custom field from the template or marking it as active. Resolve this by reviewing any custom fields on the template and ensuring they exist in your NetSuite instance. Common reasons for a mismatch are when a user has created or shared a template from a sandbox account or someone else's NetSuite account. Read only fields cannot be updated. Resolve this by removing the entire column from the template or removing the mapping to the field in row number 1 just above the column name prior to upserting your data (mapping is hidden in a white font, once in the cell, refer to the formula bar to see the value). Note, that once the mapping or column is removed future downloads will ignore this field until you reload your template. To permanently remove the column delete it from your template definition.